Like the people of Yugoslavia where it comes from, this artichoke garlic is strong and spirited, with a bite. Skins are purple-splotched outside and biege-white inside. The squat bulbs make beautiful braids -- and delicious hummus! Matures a bit earlier than other artichokes. Like other artichoke garlics, it is not fussy about soil type: it will do well in sandy, silty or clay soil. 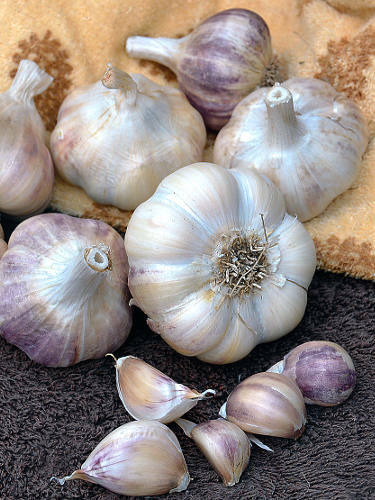 Little goes wrong with this garlic -- a good choice for beginners. 7-10 cloves per bulb.